Dark shades are usually not associated with kitchens. Most kitchens opt for lighter shades to lend the room a breezy feel. But, designing your kitchen around darker shades like brown, black and navy blue may be an interesting way to break the established mold. The allure of the color black remains unparalleled and adds a seductive sophistication to what is probably the most important corner of your house. So, if you are planning to renovate your kitchen, make it different; here are a few tips. If you don’t want to go fully black, black cabinets are a great way to start. Matte, wooden black cabinets can be incorporated into your white kitchen, along with a mosaic or marble countertop. This way, your kitchen doesn’t need to go full goth, but can still look extremely appealing with all the dark shades. The best way to make black stand out is by incorporating it with white. Split the kitchen down the middle and add black to one division, white to the other. For example, the cabinets and the floor can use black wood and tiles, while the ceiling and the walls can use white. For the places that you cannot decide upon, simply leave them as bright blank space. You can use color blocking to create a fantastic textural space in your kitchen. Paint a wall black, with marble backsplashes, or wooden textures. 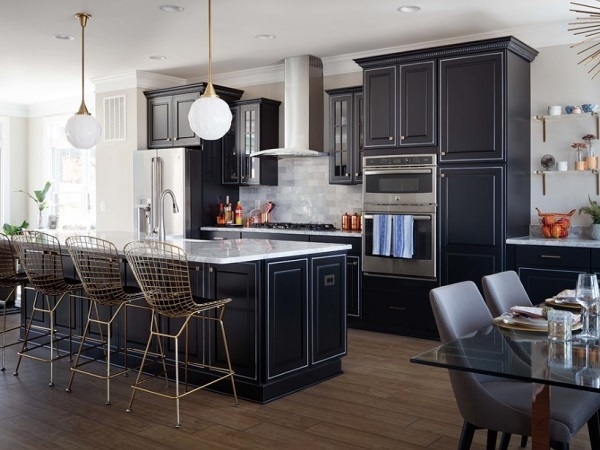 This is the best way to make a statement with your black interior kitchen designs- it breaks the monotony of a single color in the kitchen, and also adds texture. Some people prefer their kitchens to be light and breezy. Luckily, some designs allow you to incorporate the color in your kitchen without losing out on the brightness factor of the kitchen. Use black benches, black cabinets, black fixtures, and black stools and couple them with large panels or French windows. The floors and shelves can be left white, and the floor can be either marbled or textured. The color black is usually not used for industrial kitchen design ideas, but when you couple it with woodwork, white walls, and the correct balance of white and lighter shades, it simply goes to show why you shouldn’t play by the rules. Pair a black countertop with white cabinets, white ceiling, and a wooden floor for maximum effect. When you’ve already settled on the black shade, then why hold back? Create a kitchen within completely black shades, and add a dark wooden textured floor for the best effect. To create the most authentic aesthetic, pair the entire ensemble with steel and chrome. You can also a wooden dining table and wooden textured fixtures to break the monotony of the darker shades. To add a little more spark to the whole mix, add a black art piece at the entrance of the kitchen. For those who live for the gothic textures and colors, there can never be enough of black. This means that not just textures and colors of the kitchen itself, but even the accessories of the kitchen like knives, wine, glasses, mugs, teapots, cookie jars and the like should also be- you guessed it- black. The black kitchen ideas mentioned here can spruce up your kitchen like no other. So, ditch all those traditional white and light wood shades, and simply go crazy with your Goth renovation techniques!